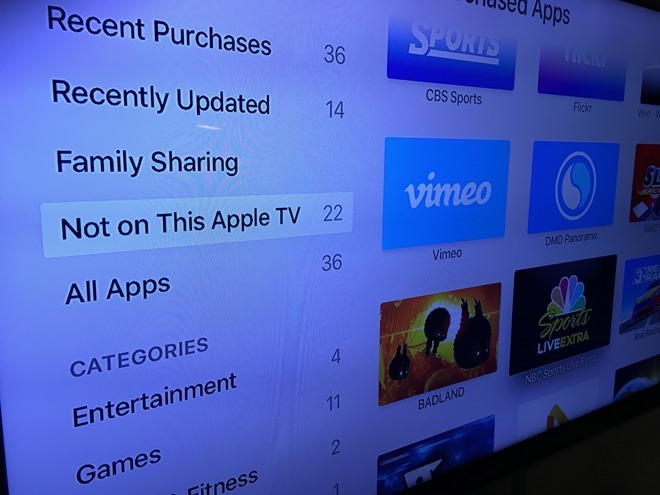 Avid app buyers now have an easier way to identify purchased apps that are available for their Apple TV but which have not yet been downloaded to that device, as Apple has added an iOS-like "Not on this Apple TV" category to the App Store. The new category functions in much the same way as it does on iOS: it shows apps which have been purchased by the iTunes account linked to the Apple TV, but which have not been downloaded to that Apple TV. Obviously, only apps with Apple TV versions are listed. The new feature was first discovered by iDownloadBlog. Apple has been slowly but steadily improving the new set-top box's user experience since its debut, but the App Store has been relatively neglected. With more than 400 apps reportedly flooding in each week, discoverability has become an issue. The situation has improved some in tvOS 9.2, notably with the addition of voice dictation and Bluetooth keyboard support. These make it much easier for users to search throughout tvOS, though more work remains to be done. While tvOS 9.2 is not expected to see public release until at least next month, the new App Store category is available to all fourth-gen Apple TV owners now.